Brandy makes this elegant appetizer spread extraordinary. Top with sieved hard-cooked egg yolk or minced green onion for a dash of color. Melt butter in skillet; brown livers and onion 5 to 6 minutes. Spoon into blender; add eggs, brandy, salt pepper and thyme; puree until well blended. Refrigerate. To serve: Spoon into small serving dish; garnish with parsley and pimiento. Place dish in center of serving platter; surround with bread slices or crackers. Heat 2 tablespoons butter or margarine in large skillet over high heat. Saute chicken livers, stirring occasionally, until brown on all sides. Stir in shallots or green onions and garlic. Reduce heat to low; cover; cook 15 minutes, stirring occasionally. Remove from heat; cool a few minutes. Put mixture a few livers at a time in a blender and puree. Combine liver mixture, remaining butter or margarine, salt, nutmeg, pepper and brandy. Blend thoroughly. Pack into a crock or bowl. Chill. Serve with toast. Makes 12 servings. 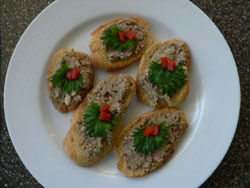 Thank you Julie and Sandy for these delicious recipes for Liver Paté and Spread. I loved them both. I suggest serving at room temperature for a smoother spread on toast or cracker. Join in and write your own page! It's easy to do. How? Simply click here to return to Appetizers.